A massive 49 from Fairlands Valley Spartans raced round the Standalone 10K race at Letchworth on Sunday. The fastest was KEITH COUGHLIN, 17th out of the 1,354 finishers in 37 minutes 33 seconds. CHRIS TILLBROOK cut his personal best (PB) by a significant 1 minute 32 seconds to come in 45th with 39:05. Next in was BRIAN WHITE taking first place in the Vet 60 plus category with a year’s best 39:12. 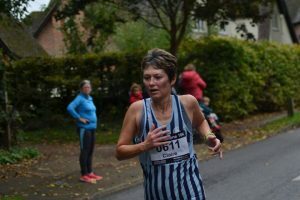 NUALA ROBINSON was fourth senior woman (18 plus) in 43 minutes 40 seconds and JULIE SIMMONS had a great race to win the female vet 55 race with 48 minutes 38 seconds, a 2 minutes 13 seconds improvement on her previous best this year. Together with CLAIRE PULLEN, 46:53 Nuala and Julie took SILVER in the County Team Championship for women. ROB SHAW was the quickest man over 70 in the race with 58 minutes 34 seconds. There were many other great FVS performances. NICK GILL, 113th cut his PB by 44 seconds to 42:34; GARETH COWELL by 7 seconds to 45:20; JO BOWDERY by a huge 7 minutes 37 seconds to 49:27; JULIE SHADBOLT by 40 seconds to 55:02; and GRAHAM HILL by a big 5 minutes 33 seconds to 57:01. Others were chalking up claims in the Spartan short distance championships with their fastest 10K times this year including TODD GRAY 41:17; DEAN CARPENTER 41:50; MARTIN DUDLEY 47:08; CLIVE CANNON 47:54; JIM BROWN 48:20; MADDIE PRITCHARD 49:53; ANN TRYSSESOONE 50:37; BARRY KING 51:27; DAVID SCOTT 51:14; STEPHEN PIKE 53:54; TRUDIE MOLLOY 57:04; MONICA SMITHSON 58:11; LORRAINE THOMAS 1:04:27; ANNE SPILLER 1:06:38 and KELLY CHAPMAN in 1:17:42. 138 NUALA ROBINSON 43:40 4th FS. 890 ROBERT SHAW 58:34 1st MV70. It was damp and dark for the last of the Hatfield 5K evening races on Wednesday but that did not seem to slow down some Spartans. 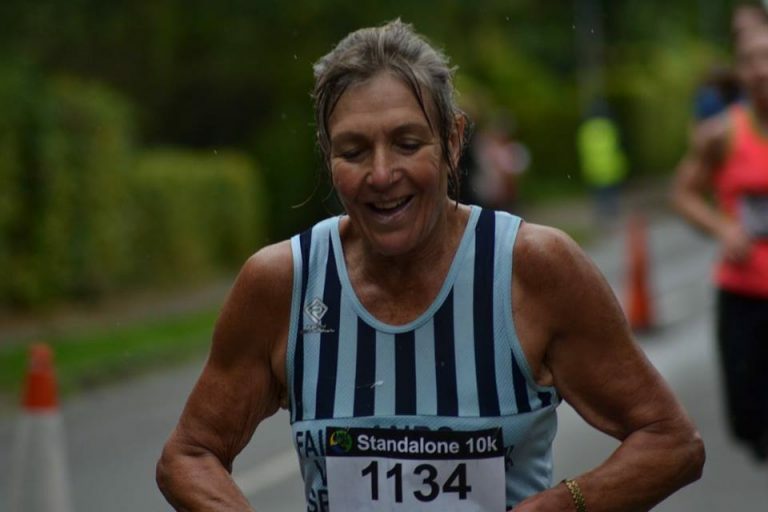 ROS INGRAM cut her 5K personal best (PB) by five seconds to 23:36; PAUL HOLGATE reduced his best time for the last two years by 21 seconds to 26:17 and STEPH MAYFIELD hers by 1:02 to 26:51. There were fifteen Spartan finishers. Across the whole series of three races BRIAN WHITE was first Vet 60 plus with an average time of 18 minutes 56 seconds, DAVID RIDDELL was second Vet 50 plus with an average of 18:04. Getting over his disappointment at being unable to finish the Worlds course Spartan STEFFAN FORD returned to his home to run the Cardiff Half Marathon in 1 hour 22 minutes 27 seconds. On an overcast day with rain he was 178th out of 19,641 finishers and 26th in his category. KYM MARTIN completed the Barnstaple Half Marathon in 2 hours 42 minutes 37 seconds. This was her first 13.1 mile race. CAROL PAUL completed the Flower of Suffolk off road marathon in 5:12:56. The marathon started in Walberswick in Suffolk and went towards Sizewell and back. It was a very windy day with rain at times and some muddy parts thrown in as well. It was mild, dry with a light breeze but damp underfoot in Hyde Park for the Last Friday of the Month 5K race round the Serpentine. JIM BROWN was 152nd in 24 minutes 15 seconds. The popular lunch-time race has its 25th Anniversary on Friday 27th October. It was a quiet week of parkrunning for the Spartans. At Stevenage THOMAS SAUKA was the first Spartan finisher, sixth over the line in 20:01. LEE PICKERSGILL was next in 26:18 followed by JAMES SOUTH (27:56) and ROGER BIGGS (30:06). TREVOR BROOM secured a new course Personal Best, crossing the line in 32:24, and SELVAN NAICKER finished in a time of 36:46. KELLY EVANS was first woman to finish in 24:23, a new course PB, with JULIE SIMMONS in third place in 24:49. VERITY FISHER incorporated the parkrun into a long run ahead of next weekend’s Peterborough Half, and finished in 10th place in 26:26, with TRACY PEZ next in 27:46. KAREN PALMER (28:27) and KAREN BROOM (31:23) were next. Elsewhere in local parkruns KEN JUDE ran 26:02 at Panshanger and TIM ROBINSON was 24th in a new course PB time of 23:58 at Pymmes. Further afield, DAVID SCOTT completed in 26:10 at Penrith parkrun while ROGER HARDMAN ran at Newcastle parkrun, completing in 27:21. Serpentine 25th Anniversary from the boat house on Friday 27th October. Watford Half Marathon on Sunday 4th February.